CRICKET: Australia has landed the first blow in the battle for the Ashes with David Warner and Cameron Bancroft capping off a dominant Test win at the Gabba. Warner and Bancroft steered Australia to a 10-wicket win with a 173-run partnership to wrap things up on Monday morning. The pair enjoyed half-centuries late on day four and continued chewing up England's modest target of 170 on the final morning. Warner finished unbeaten on 87 while debutant Bancroft hit the winning runs to finish 82 not out. "It's fantastic to get out there, have a good dig together and build a great partnership and get us across the line without losing a wicket," Warner said. "That's what we cherish, coming out and being disciplined and trying to get the job done as best as possible." England's hopes of victory disappeared on Sunday with Moeen Ali's controversial stumping triggering a batting collapse in the face of fearsome fast bowling from Mitchell Starc (3-51) and Pat Cummins (1-23). Moeen was on his way for 40 following a sharp stumping by Tim Paine which was not without controversy, with some suggesting there was too much doubt to effect a wicket. Ali's exit was compounded by the blows of Chris Woakes (17), Jonny Bairstow (42), Stuart Broad (2) and Jake Ball (1) as England were bowled out for 195 before tea. Australia owned the first session of play, with Josh Hazlewood (3-46) and Nathan Lyon (3-67) starring. Earlier, Hazlewood trapped captain Joe Root in front for 51, and Lyon had Mark Stoneman (27) and Dawid Malan (4) caught at first slip by Steve Smith. Hazlewood accounted for Alastair Cook (7) and James Vince (2) on Saturday. Smith confirmed his status as the best Test batsman on the planet on Saturday before Josh Hazlewood drove home Australia's advantage in a big way, despite England going into day four with a seven-run lead. 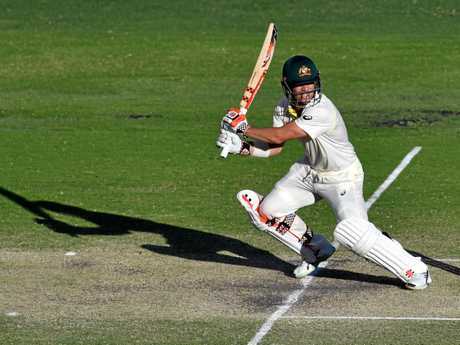 Smith (141*) delivered with an incredible captain's knock which brought him a 21st Test century and gave Australia an unlikely 26-run lead on day three at the Gabba.